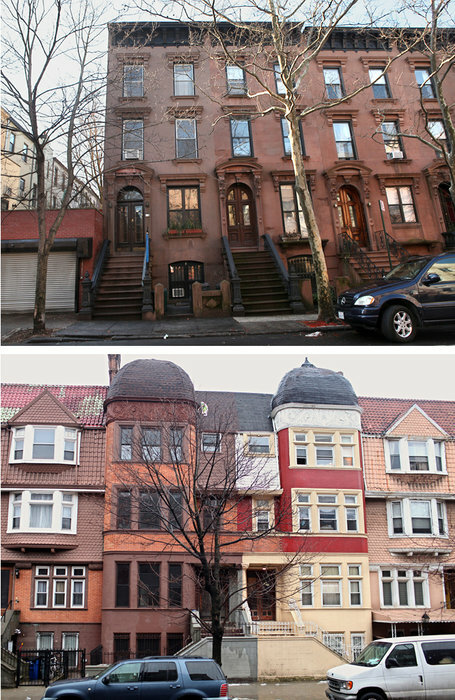 (a study in contrasts: the photos that accompanied pieces about Crown Heights from the NYT's Sunday Real Estate Section, above, and today's Metro Section). Until Sunday, the New York Times hadn't been out to Franklin Avenue since 2009, when they sent a reporter to cover (and help manufacture) the "Franklin Avenue Coffee Wars." As of this week, however, Crown Heights is officially on the Grey Lady's radar. On Sunday, we landed on the front page of the Real Estate section, paired with Carroll Gardens and praised for "a trove of brownstones and row houses" in an article aimed at prospective homeowners entitled "So You're Priced Out. Now What?" Today, we're in the Metro Section, where Liz Robbins paints a more complicated and thorough portrait of the neighborhood in article titled "Unease Lingers Amid a Rebirth in Crown Heights," which comes complete with its own Franklin Avenue slideshow. Robbins's reporting does a nice job of capturing the voices of different residents and business owners (love the quotes and images from the Franklin Avenue Merchants) and gets at many of the challenges and contradictions Crown Heights faces. That won't keep ILFA from nitpicking (Times articles are blogging gold, after all), but I do so in the spirit of furthering an interesting conversation, not tearing the article down. The Crown Heights Riots loom large in this piece, which is no surprise - most New Yorkers still free-associate "Crown Heights" with "riot," and we just observed their 20th anniversary this summer. That said, I wonder a bit about Robbins's contention that gentrification on Franklin Avenue is "set on scarred earth" on account of the riots, or that "an undercurrent of unease, suspicion, and resentment from some longtime residents, a legacy of the riots." The photos in the slideshow make this claim as well, but somewhat misleadingly: the 8 photos of Crown Heights today are on Franklin, while the photo from the riots looks to me like Utica Ave, over two miles east. From what I understand (and to be fair, I wasn't here when they happened), the epicenter of the riots was considerably east of Franklin Avenue. That doesn't mean they weren't a watershed event for residents of Franklin at the time, or that people weren't affected by them. But having spent four years writing about Crown Heights and having watched how the riots were commemorated this summer, outsiders are much more likely than locals to use the "riot" as an explanation or frame for all things Crown Heights, both past sufferings and current changes. Franklin was indeed "scarred earth" in the 1980s and early 1990s, but that wasn't really a result of the riots (things were bad well before rioting began in August of 1991). Rather, the riots, like the drug dealing Robbins mentions, were symptoms of massive, systematic metropolitan disinvestment in neighborhoods like Crown Heights. For decades, Central Brooklyn experienced real-estate and banking redlining, urban deindustrialization, massive unemployment, the reduction of much-needed city services after the collapse of the urban welfare state amid the fiscal crises of the 1970s, and the resulting rising crime, decreasing in educational and economic opportunity, and declining living conditions. Locals fought hard against this onslaught, creating major institutions like the Bedford-Stuyvesant Restoration Corporation and Medgar Evers College and working through much smaller community organizations and block clubs like the Crow Hill Community Association to improve streets, schools, and safety. As Robbins notes, they redoubled their efforts after the riots, and their efforts are major reason why Crown Heights is changing today. Insofar as there is "unease, suspicion, and resentment" (and Robbins is absolutely right that these feelings exist, and she does a great job of finding these voices), it's not, in my experience, so much a legacy of the riots as a feeling that after years of fighting without the city's support to improve their neighborhood, longtime residents are now being priced out on account of these improvements (and, in some cases, the sense the city is using services selectively - impact zones, charter schools - to serve new arrivals at the expense of longtime locals). As Assemblyman Hakeem Jeffries puts it while discussing his opposition to the re-branding of Crown Heights at the end of Robbins' article: “The collective efforts of the black and Jewish neighbors are what made Crown Heights the destination and the attractive neighborhood it is today.” Attempts to whitewash or ignore these efforts, or the displacement of these people who worked so hard for so long, seem to be very real and very fair sources of resentment. One other thing I absolutely must point out, because it's a common mistake that can be completely misleading and drives me up the wall: the white population around Franklin Avenue has absolutely NOT "increased 15% in the past ten years, according to the 2010 census." A 15% increase is a relatively mild thing - adding three people to a group of 20 is a fifteen percent increase. 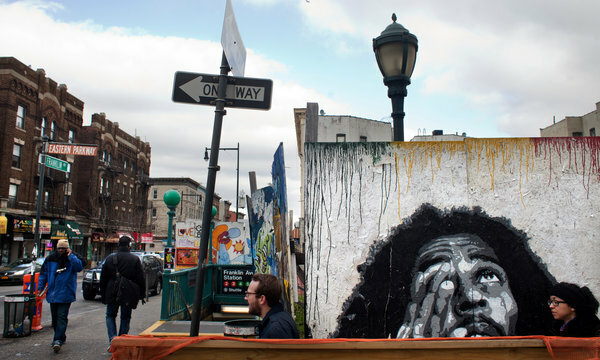 In the four census tracts that border Franklin Avenue between Eastern Parkway and Atlantic Avenue, the percentage of the population that was white in 2010 was between 16-28%, which must be what the article is trying to say. However, as there were very few white residents in these census tracts in 2000, the increase in the white population in these four tracts from 2000 to 2010 was between 350-1,198% (you can see this plain as day on the New York Times census map). Another way to say this would be to say that the white population has quadrupled (in the tract bordered by Franklin, Classon, Park, and Eastern) or has increased twelve-fold (in the next tract over, between Franklin, Rogers, Park, and Eastern). The black population, during the same period, has experienced a nearly-uniform 30% decline, which means that almost a third of the black residents who lived in these four tracts in 2000 don't live here anymore (at least - it could be more than that due to internal turnover within the Black population over the decade, of course). Stats mistakes aside, an interesting article. Thoughts? Great comments on the article Nick! I fear that the business owners will over estimate the wealth of the newcomers, and under estimate the amount of hard work that it takes to run a business here. While the newcomers DO have far more income (and desire) for drinking, shopping and eating, their means are not actually limitless. Lots of money is lost by businesses and real estate developers that don't correctly predict demand. While I think everyone would prefer a process of change that is gradual and certain, no one has control over the actions of any investor but themselves. The consequence for those who guess wrong, or those who can't adapt to changes, is exclusion. I think you are being rather charitable to the Times. They did seem to interview a wide variety of people (notably excluding relative newcomers, but okay). However, the tenor of the article seemed to hit the expected notes of gentrification and resentment (i.e., describing Bob and Betty's as selling organic foods to new, and giving boxes to outgoing, demographically distinct, residents). This seemed to be based less on inquiry and more on assumption. She went looking for what she expected to find, in my view. I think a more interesting story would be about how different demographics in our community are working collaboratively and collectively to make improvements in the neighborhood. Yes, and it is those very neighborhood improvements (in combination with the profit motives) that are a large part in driving the overall change. Neighbors who are isolated and unable to work cooperatively get lousy neighborhoods. Due being priced out of other neighborhoods, newcomers who are able to work cooperatively have combined forces with the old timers who have long wanted to work with others but lacked the power necessary to overcome the tide. For the first time in a long time, this neighborhood now has that power. To the horror of those who have long wanted it, they will learn that this "new" power is very imprecise, and that no one actually controls it. Real neighborhood change is a combination motives. Some seek Adam Smith's profit. Some seek Jane Jacob's utopia. ...as long as you have both groups, you get a better end result. Nick, as you probably know by now, the little boy who was unfortunately killed by the ambulance truck was playing outside an apartment house on Utica Avenue. My understanding was that the rioting was in that area, and did not extend as far west as Franklin. Anonymous - agreed. It's one reason I thought the juxtaposition of the photos of Franklin with the photo from the riots out on Utica was confusing/misleading. My experience with articles like this in the big dailies is that they become something of a composite effort - the reporter writes it, editors put a totally different spin on it, it gets rewritten, etc etc, and the end result might reflect the perspective of someone who's never been out to Crown Heights. Like Nick, I thought that the article offered a decent perspective on what's going on in our neighborhood, albeit with some dramatization as in the quote that touched on "Bob & Betty's". The screw up on the stats actually took away from the most remarkable part of the story: that the white population has recently increased four fold or even twelve fold (as Nick cites above). Although this data is taken from the Census which covers a ten year span, we all know that the rate of change has accelerated rapidly in the past three years. Just three years ago (I date my own entrance into the 'hood) a white face on Franklin was still remarkable, while now, of course, we white people are quotidian. THAT'S BIG NEWS! And, the degree of 'whiteness' is really offering us a way to track socioeconomic changes, since the black population that filled CH previously was (for the most part) desperately poor. "a feeling that after years of fighting without the city's support to improve their neighborhood, longtime residents are now being priced out on account of these improvements (and, in some cases, the sense the city is using services selectively - impact zones, charter schools - to serve new arrivals at the expense of longtime locals)." Why does the neighborhood now, as MikeF puts it above, "have the power"? Unfortunately, the NY Times article doesn't address that adequately. It is also important to note that gentrification, while often associated with white people entering a predominantly non-white neighborhood, is not soley about race. There are plenty of "gentrifiers"--people of higher income who were NOT born and raised in the neighborhood whose lifestyles and preferences contribute to things like increased housing prices, more coffee shops, organic markets, boutiques, etc.--who are NOT white. I wonder how much more extreme the ratio would get between new arrivals/old residents if one could factor the NON-WHITE educated professionals into the equation? Unfortunately, we're stuck using Census data about race as a proxy for socioeconomic status. Neighborhoods change. As time passes, they are occupied by people who vary in appearance, education, income, etc. Some people fret about the changes, and believe it is important to have what they consider to be the ideal mix. I've always found that to be unachievable, like demanding that a given restaurant serve all clienteles and preferences. ...in this case, no individual even owns or controls the restaurant. fyi (for anyone else so inclined): I looked at the report linked to above & there is nothing useful to this conversation. We already know: more white people, less black people, higher median incomes, higher rents. Maybe we should define goals. Is one of the goals to feel better (less guilty) about the change? We could do this by trying to explain to people who can no longer afford the 'hood that this primarily about money, not race. As pointed out above, there are lots of salaried, middle class folks that have lived "here" for decades. We don't feel sorry for someone who sells their home and retires, right? We could go so far as to try to convince ourselves that the relationships between race, privilege, income, education, etc. are now minor. Is one of goals to stop the change, and/or at least give low income people some local places to live and shop? We could create incentives that trumped the profit motive, or gave people more money to serve people who have less less money. Is one of our goals to have only "good" neighborhood change, with no "bad" side effects? What if we don't agree on what is "bad" or "good"? Is one of our goals to try to change those at risk of being displaced? After all, if they earned more $ they could probably continue to stay. ...We could make college free, and prepare people for high paying jobs that may not exist. Is one of our goals to distance ourselves from those who lived before us, so we can believe that we are somehow better? In a complex society, no one controls a neighborhood. The forces of democracy and capitalism (and yada, yada, yada) all collide ....much like evolution in nature. Don't worry, there are easy options. For example, those who want to live in a neighborhood like Franklin Ave was in 2008, could probably move to Nostrand. Lol. There's not much difference between franklin ave and nostrand ave except that there is more bars and organic food markets on franklin. I still very unsafe walking down Franklin ave. The only difference is the demographics and you know what I mean. Wow. veiled racism at it's finest. The hipster movement is fake its full of a bunch of people who just want to change crown heights and turn it into a giant SoHo. 5 people splitting rent cmon. This is not the 80s u guys should of just stayed in park slope. Everything we have u guys want. Anything with a history of culture and struggle. Go start a legacy where u grew up.